When it comes to a wedding, your choice of musical entertainment is one of the most important things to get right. A bad wedding band has a dramatic effect on the atmosphere of a wedding and may be the deciding factor on whether your wedding party flies or dies. What you are looking for is a full dance floor with music that appeals across the spectrum of your guests. Does the wedding band fit in your venue? – You need to ensure that the venue of your choice has the space allocated to facilitate a band. This is not a standard and should be established long in advance of booking any band or venue. Venues often have requirements that your band should meet e.g. insurance and portability equipment certificate. Make sure that your band meet the venues required criteria. Type of Music – Your music choice has to reflect your individual personalities. Are you more suited to classical, funk, rock music etc. in your every-day life? For example do you want a string quartet and quiet ambience or do you want music that will make people dance? Ask for a wedding playlist and highlight the music that you like and dislike and ensure that there is enough choice within your preferred music genre. First Dance – If you plan on beginning your evening with a traditional first dance then be clear that the band of your choice can play your requested song. How long will the band play for? – Do you have a closing time in mind? Make sure that your band can play for the amount of time you require. It is also a good idea to think about intervals and breaks and how this time will be covered. You may have ideas on how you want the evening to end and it is a good idea to discuss this also. Budget – What does your budget allow? There is a variety of choices available to suit your budget. You will for example probably pay more for a wedding band then for a DJ (once you are not opting for a celebrity DJ!). However, a band is much more likely to create atmosphere than a DJ. Experience – On this very important day it is essential that you pick experienced and professional musicians who will not let you down and can guarantee a smooth and professional experience for your guests. Make sure the band you book is the band you will get – It may be hard to believe but some wedding bands in Dublin take bookings on one band and provide different band members on the night. It is very important to ensure that the wedding band you have booked and received demos from etc. is the wedding band that will play on the night. Prepare a list of questions – Before you make a final decision on a wedding band it is a good idea to run through a list of pre-prepared questions and clear up any uncertainties way in advance of your big day. Get all agreements in writing. Then all that is left is to enjoy your big day! 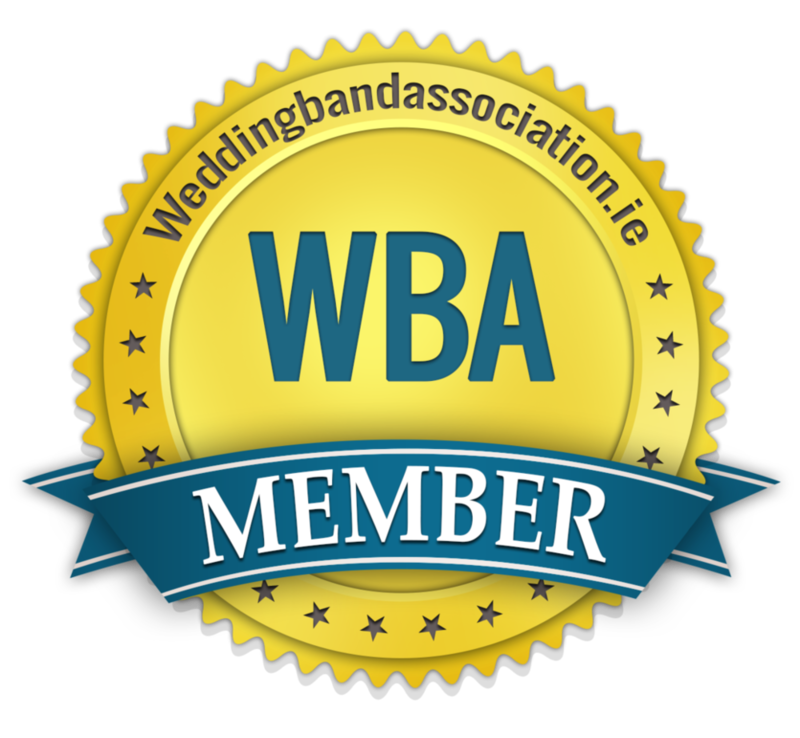 The Panoramics are delighted to be a member of the Wedding Band Association of Ireland. The motto is "One band, one gig", which is what you need to look for in your wedding band. The Association is an attempt to bring some quality control into the industry, with certain standards of business practice being required for membership. Great, you have gone to various showcases and found a band that you like! Your search for a band is now over. But hang on, the band you booked are not the band that show up at your wedding! Crash, boom, bang! Now before we go any further, musicians are subject to getting sick, therefore it might be the case that one member can not make it, we all get sick right? But not the whole band!! In the case that a completely different band turns up on one of the biggest nights of your life, well, this is simply inexcusable! Some booking co-ordinators run an empire of bands using the same band name, WHAT??? An empire of bands with the same band name. how does this work??? Very simple, you view the band at a showcase, you like the singer and the band, then you book. Great, but would you be happy if only the singer that you picked at the showcase turned up on the night with a completely different band? Or would you even remember what the band looked like on the day of the showcase? And guess what, the same band name you booked at the showcase are playing at various other weddings around the country on the same night. Not that special after all! The Panoramics wedding band and a lot of the other professional top wedding bands in Ireland have had the same core band members from the beginning. Now musicians come and go, but a group of musicians that turn up at your wedding that never met each other before can only mean one thing! Disaster!! Does this really happen? YES it does.